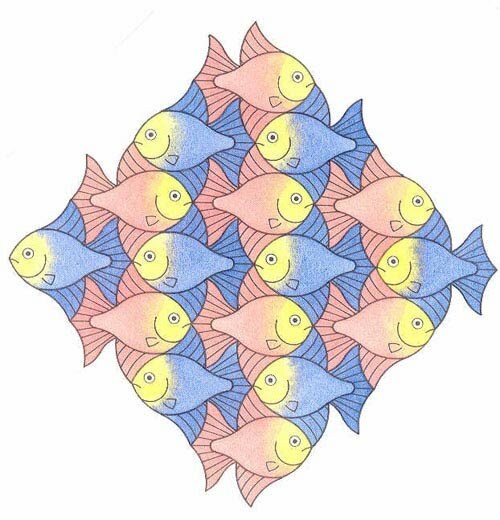 Fish 2 consists of fish with an inherently curved outline, and so consequently they more naturally resemble real-life fish than the more 'severe' geometric and arc outlines of Fish 1. Again, as with the 'better' analogy with the two distinct types of outline of Birds 1 and 2, this is not to say that these are of a superior nature in comparison, as they are of different types, as one is not comparing like with like. This example neatly illustrates a discussion pertaining to fish motifs pertaining to the ‘ambiguity of outline' as discussed with Essay 3, Motif Choice. As can be seen, the fins are most vague as to any specific shape, from which the task of adding a fish motif to an arbitrary outline can thus be relatively simple. This fish motif can also be seen on the Polyhedra page, applied to a tetrahedron. A minimum of three colours is required. Red, yellow and blue are chosen, these being at the maximum separation on a colour wheel for maximum contrast. A minimum of two colours is required. 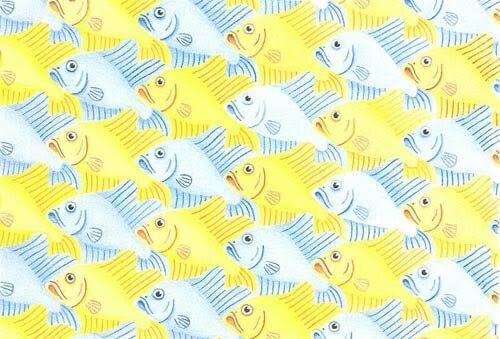 A more complex colouring scheme was chosen (in relative terms), in which the fish are coloured in two core contrasting colours of red and blue, with the head for both consisting of a third colour, yellow, an example of the technique known as ‘wet in wet', resulting in a most pleasing transition effect. Such a colouring scheme was undertaken with the three basic primaries in mind, each of a theoretical equal distance around the colour wheel, although to be pedantic such a wheel is a gross oversimplification - see Essay 1. Again, although nothing of any great significance, such a variety makes a welcome change from a simple two colours of alternate contrasts. A minimum of two colours is required. A basic core colouring of the complementary colours yellow and violet are chosen, with variety added by means of coloured stripes of green and red. 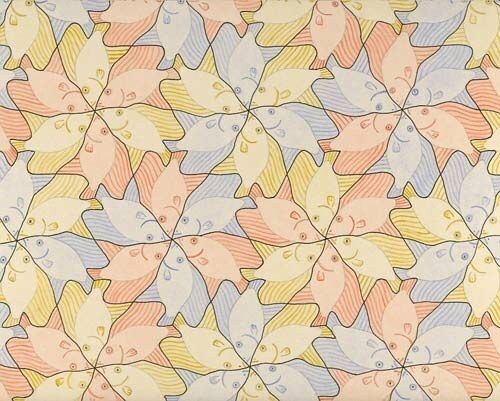 Instead of the usual ‘flat' colouring of motifs, the fish are shown with more regard as to a strict realistic portrayal. Each fish has deeper shading at their extremities, along with curved stripes, both of which are an attempt at a three-dimensional appearance. Also paid more attention than to than normal are the fins and tail, with finer detail added. 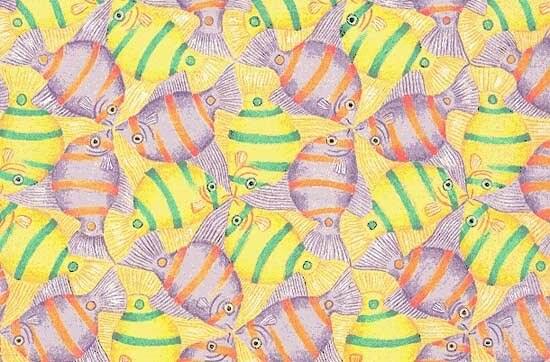 However, arguably the inclusion of stripes thus renders each individual fish to be of less clarity than is ideal i.e. the eye ‘struggles' to easily pick them out. A minimum of two colours is required. Arbitrary colours of yellow and blue are chosen, with more attention paid to the rendition than usual, with shading to suggest three-dimensionality.